The origin of theatrical jazz dance is not that long ago. 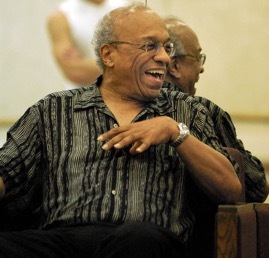 Many of the pioneers are still with us, making it imperative for their first hand experiences and recollections of the evolution of theatrical jazz dance to be recorded. 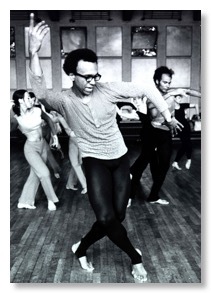 One such person is dancer/choreographer Donald McKayle. Known for his classic modern dance works like Rainbow ‘Round My Shoulder and Games, he also worked with many of the pioneers of theatrical jazz dance as it was being formulated. His piece District Storyville made use of vernacular jazz movements in retelling the beginnings of jazz music in New Orleans. I was able to interview McKayle when he was in residence with the Youth Performing Arts School in Louisville, KY, and this is his story of the beginnings of theatrical jazz dance. "I started in the middle 1940s to take classes, and there was no jazz dancing as such being taught. There were people teaching tap - in Harlem especially - Norma Miller, Mary Bruce - and she had kids who could tap and do wonderful things. They were these lines of girls, basically, and there were groups of tap dancers. So those were the first kinds of lessons that would presage what we have today." McKayle noted that in the 1940s, there were classes in ballet, tap, acrobatics, modern, and ethnic dance, but no jazz classes to speak of. His early training came at the New Dance Group studio, at that time located on 59th between Madison and 5th Ave in New York City. There were classes in modern dance with Jean Erdman and Sophie Maslow, and within a one block radius were classes in Indian dance, flamenco, and the School of American Ballet. "Balanchine was starting, all of his work which led into Ballet Society and finally the New York City Ballet." McKayle's first exposure to theatrical jazz dance was in niteclubs and in a concert organized by NY Times dance critic John Martin. Jack Cole was performing in niteclubs with Evelyn and Beatrice Kraft, presenting authentic East Indian dances that eventually he merged with the swing beat of the Lindy. He remembers the Martin concert as a benefit for the Spanish Refugee Appeal in the late 1940s at the Ziegfeld Theatre. "And it had Ethel and George Martin, Bob Alexander, Carol Haney - and they did Sing, Sing, Sing. It was fabulous (he laughs). 'Whoa, what is this!?'" he exclaimed at this new form of jazz inspired movements. The lindy was very important to the Cole style and feel, according to McKayle. "Jack had lots of sequences based on the lindy, cause every time you auditioned for him, you had to do a lot of footwork. Which was based on the music and the shifting and partnering, but taken solely without a partner. I think he used that and just took it somewhere else." Along with most who rubbed shoulders with Cole, McKayle remembers him with fear as well as reverence. "Jack would put you through it, and you had to look like you could survive. And if you didn't survive, he would just run right over you. He was a scary guy!" Like Cole, another modern dancer who ventured into early theatrical jazz was choreographer Daniel Nagrin. He was assistant to choreographer Helen Tamiris, later married to her, and he added a theatricality to modern dance, set to a contemporary theme, that McKayle saw as another early strain in theatrical jazz dance. "When I first worked with him (Nagrin), it was the end of the 1940s into the 1950s. He was assisting Helen and doing his own personal choreography. And so he developed things like Strange Hero, with the Stan Kenton music, and it was all about the gangster as a hero in Hollywood. And it was a wonderfully theatrical dance, absolutely. And because he had this wonderful theatrical quality, he did not have a technique that was purely modern dance." It was another early use of jazz dance in a concert setting. In the 1950s, choreographer Katherine Dunham had a school in New York City, but as Dunham was often on the road, classes were taken over by teacher Syvilla Fort. "She dealt with the blues, swing, things like that, and there were, of course, dances of the Caribbean." But McKayle feels that the Dunham school training was not ideally suited for the dance demands of Broadway. "A lot of people who were on Broadway went to her classes, but there was no 'step' if you trained with Dunham that you would do on Broadway." Interestingly, McKayle credits a non-jazz dancer with early creation of a need for theatrical jazz dance. "Maybe the person most responsible for that who had nothing to do with jazz dance was Agnes de Mille. Because she was the first choreographer that made dance an absolutely unique element in a show." He feels that by making dance a creative element rather than just a diversion, there became an instant demand for concert choreographers on Broadway. Modern dancers like Tamiris and Hanya Holm, ballet choreographers like Michael Kidd and Jerome Robbins, and the jazz dancers Cole and Fosse. Now dancers had to be trained in technique and expression as well as just displaying marginal ability and good looks. Acting skills were important, also, in the need to create characters who danced. West Side Story (1957) is often cited as a pivotal point in theatrical jazz dance history, due to the ingenious use of jazz, ballet, and social dance by Jerome Robbins. But McKayle, who worked as dance captain and swing dancer with the original cast, sees the contribution of jazz movements differently than most historians. "I was in West Side Story, the original, and that wasn't jazz dance. It was very theatrical, quite marvelous, but the part that was closest to jazz is what Peter Gennaro (assistant choreographer) did. Of course, Jerome Robbins took all of the bows for Peter's work. It was Peter's work that was closest to jazz dance. 'America' was Peter's, all of the Shark movement in the gymnasium was Peter's...he was an unsung hero. I think he was terrific. What a fine choreographer." Another of McKayle's favorites is choreographer Talley Beatty. In 1959, Beatty choreographed The Road of the Phoebe Snow. Set to music by Duke Ellington and Billy Strayhorn, the 30 minute piece was about life on the wrong side of the tracks. Also by Beatty is 1960’s Come and Get the Beauty of It Hot, set to Dizzy Gillespie, Charles Mingus, and Gil Evans, and in the 1970s he staged many Broadway shows. McKayle said "All of Talley Beatty's pieces were set to jazz music and were fierce, you know. I think he was a very good choreographer in terms of theatrical jazz. One of the best. And way ahead of a lot of other people. He's gone now, but his work lasts." As for today's theatrical jazz dance, McKayle is both optimistic and worried. "I think that at this point to see jazz so strong in the universities means that it has established itself. There's still certain places you can hit a problem because of people who are just backward, and think that jazz is not worthy. So, I always speak up...there is prejudice, in terms of the newspapers and everything. We have to get past all of that. And it takes time. I think time is compressed now, so I don't think it will take us long. " But it is refreshing to McKayle to see new individual movements in jazz dance, similar to those of the 1940s and 1950s. Of Savion Glover in Bring In 'da Noise, Bring In 'da Funk, McKayle says "he makes a point of saying that tap dancing that has lines and class was kind of diluting what he calls 'da beat.' It will take awhile for all of that to find its own center. And it's all healthy. I like to see this kind of discussion." As someone who has made a life in dance and theatre, and experienced a range of styles and philosophies, Donald McKayle treats it all with devotion and respect. Dancing is not a passing fad, but an essential force that lives within. "To me, passion is so essential...it hurts any kind of dance when there's no artistry. There are just feats." After living through the then and now of jazz dance, he sees the future of jazz dance as depending on absorbing the new, and preserving the old. "I am always glad when I see new movement, it's just I hate this sort of throwing out the old as if it was garbage, you know? You have to preserve and build, rather than remove and replace. As in any technique."